Modern – for that fresh and modern look that excites the eye. Art Deco – for that stylish, old but new look that never goes out fashion. 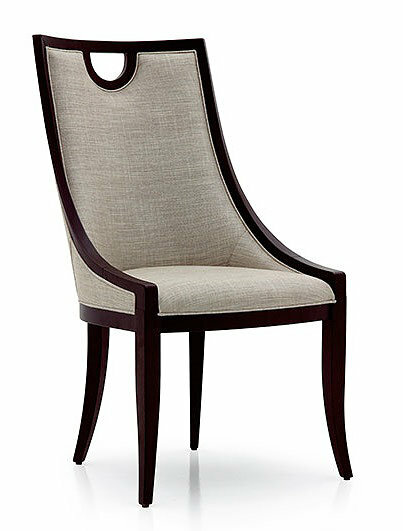 Traditional – for the décor that needs a traditional style chair to match. Rustic – for the less formal décor. As well as providing chair styles to match most types of décor our service goes further by enabling customisation of our dining chairs. Once you have found a chair style you like, you then choose your fabric type and wood stain colour. We have 13 fabric types to choose from including chenille, marble (velvet type) and faux leather. You then choose your wood stain colour – 12 options are available. Once you have placed an order (all transactions are secure on Just Dining Chairs), you can sit back and relax. Your chairs are manufactured in the West Midlands and despatched to you within 4 weeks of placing an order. The wood on our custom dining chairs are clear lacquered to preserve the colour and protect against knocks from home and more demanding public building use. We provide excellent value for money compared to other suppliers and our central location means we can deliver to most regions of the UK. We think interior designers will love the flexibility and choice provided by services. Bring your vision to life by matching the type and colour of fabric and wood colour.